Yesterday I have put up Escher’s Circle Limit IV – Heaven and Hell on my new desk. 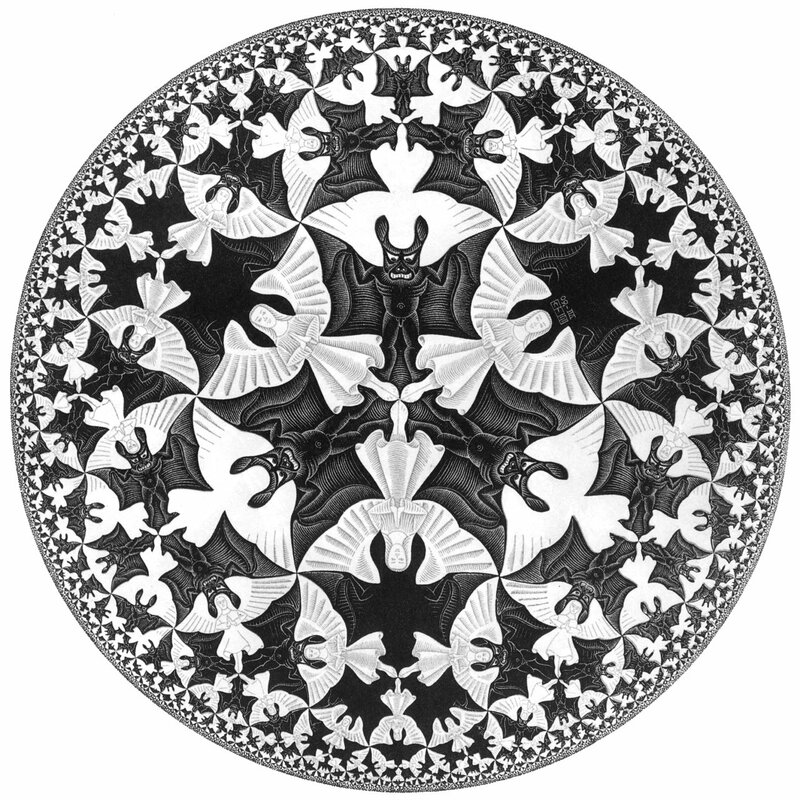 The Circle Limit series of drawings was drawn by Escher are essentially what are known as his hyperbolic tesselations. The new computer table that I have got has an odd shape. On one end the side is circular and it smoothly metamorphises into rectangle on the other side. Though it is not at all comparable to what Escher has accomplished, I feel bad even when I use the word metamorphosis for this, but I have not found anything better. The table is designed for use with a desktop. So it has sections for different parts of the desktop like the monitor, CPU keyboard etc. Anyways the main point that I want to tell is that the table at one end is circular. Since I had put Escher’s Three World on another table, I thought it would be a good idea to use a ciruclar print of Escher for this part of the table. Of all the prints I had, which I had taken when I had at my disposal A3 sized printers, the one which fitted the purpose seemed to be Circle Limit IV – Heaven and Hell. Like most of Escher’s drawings this one also takes you to a different world. A world which is far away from the reality. A world of mathematics. A world of abstraction. But then as always we can make connections between this abstract world and the real world. The connections that we can make are dependent on the world view that we have. Some people fail to make the connection. They cannot `see’. This must be certainly true, as most of his artwork is nowhere close to what we see in the light. I rate the artwork of Escher as greater than that of the renessaince artist’s as they had just beautifully drawn what one could “see.” But with Escher we go a step beyond, imagination takes the control. What interests me in Escher is that he can make you imagine the unimaginable. What you know is not possible is demonstrated just in front of your eyes. Logic is discarded. Rather it is kept in the basement which is upstairs for Escher. Yesterday you start to believe what you thought was impossible tommorow. The way different things merge for Escher is just unparalled in the work of other artists. What has now become known as “Escheresque” is just the typical of his style. Lot of later artists are influenced by the works of Escher, I have found one Istvaan Orosz particulary good. There are others who are equally good but I don’t remember their names now…. Coming back to Heaven and Hell. The main artwork is in a woodcut format in black and white. For me this is a kind of dyad which represents the world. The idea of two opposing forces one termed to be evil and the other good are all permeating in the Universe. Here also the bat-devils and the angels are the representative of the same. There is no part of the Universe where these two are not present. It might seem that somewhere far out there there is nothing, but it is not so. Even there, the design is the same, it is just too far for us to see. This is what harmony in the universe is about. It is the same everywhere, when you have a broad enough world-view. The cosmologists say that the Universe is homogenous and isotropic, if you choose to “see” it at the right scale. The cosmologists often use Heaven and Hell to illustrate this point. For me introduction to Escher came in a talk by a cosmologist who used The Waterfall to illustrate the idea of a perpetual motion machine. Since then I have become addicted to Escher, as has everybody else who has some sense of imagination. For those who cannot appreciate Escher, I can just pity at their miserable imagination. This entry was posted in art, circle limit 4, cosmology, escher, h s m coxeter, heaven hell, orosz. Bookmark the permalink. One of my faves too… Its got bats & angels 😉 !!! & it reminds me of the picture of the early universe that I got from Varun Sahni's lectures.But whats news about the glass cover for this masterpiece?